Tewkesbury was granted a Charter by Elizabeth I in 1574, which created the Common Council to govern the town, which comprised two Bailiffs and twelve principal burgesses. This Common Council continued until it was swept away by the Municipal Corporations Act of 1835, which incorporated the town and provided for the election of a Mayor and an elected Council. Both the Common Council and the Borough Council signified their approval of documents by the use of a Common Seal, which displayed a representation of a castle. The chain of office worn by the Town Mayor of Tewkesbury has this castle on the medallion. In 1885, legislation was enacted that allowed Borough Councils to award the Honorary Freedom of the Borough to persons who had rendered meritorious service to the town. Tewkesbury has used this power sparingly, the first recipient was the Victorian Builder and restorer of the Abbey, Thomas Collins. In 1964, the Council decided to award the Freedom to Sir George Dowty, who had brought a good deal of new employment to the town. Sir George decided to mark this honour by presenting a Coat of Arms to the Borough. He commissioned Sir Anthony Wagner, Garter Principal King of Arms, to design an appropriate coat. Heraldry is a complicated subject, being governed by rules, which have evolved over seven or eight centuries. All the symbols which appear on a coat of arms have some reference to the personality, history etc of the recipient. The Tewkesbury Coat of Arms is no exception. The shield depicts a golden cross on a red background, which refers to the arms of Tewkesbury Abbey. In the top part of the shield there is a castle taken from the seal of the Tewkesbury Corporation and this is flanked by the red rose of Lancaster, and the white rose of York, making reference to the Battle of Tewkesbury in 1471. In the crest above the shield, there is a green lion with two tails, which is taken from the arms of Robert Dudley, Earl of Leicester, who was responsible for obtaining the first charter in 1574. The lion is emerging from a Saxon Crown, denoting the town’s ancient origins. Between its paws, the lion is clutching a black pear, which appears in the arms granted to Sir George Dowty. 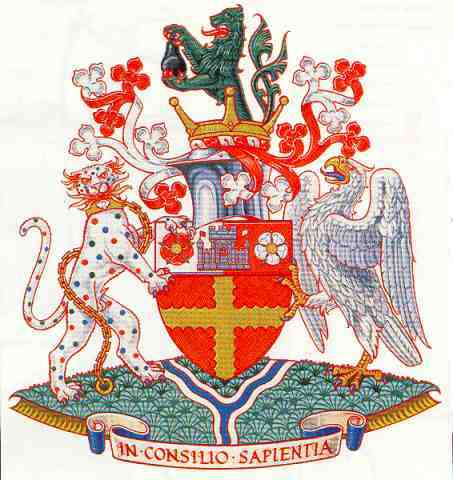 The shield is supported by a panther, taken from the Arms of the Dukes of Beaufort, who have served the town as High Steward, and an eagle taken from the Arms of the Earls of Coventry, whose family have had a long association with the Borough. The shield and supporters stand on a green compartment, which shows two rivers meeting, a reference to the Severn and Avon joining at Tewkesbury. The Coat of Arms has a motto in Latin, “In Consilio Sapientia”, which translates as “There is Wisdom in Counsel”. With the reorganisation of Local Government in 1974, the new Tewkesbury Borough Council was formed from the old Borough, the area of the Cheltenham Rural District Council and parts of the Gloucester Rural District Council. A Chain of Office was made for the use of the Borough Mayor and the Coat of Arms is depicted on the medallion. In addition the chain has links which show the Castle emblem of the former Borough Council and the badges of both Cheltenham and Gloucester RDCs. The plate, which was sold at the AGM of the Tewkesbury Historical Society, has the Tewkesbury Coat of Arms as its centrepiece. It was made by the Spode factory as a souvenir of the Tewkesbury Festival held in 1971 to commemorate the 850th anniversary of the consecration of Tewkesbury Abbey and the 500th anniversary of the Battle of Tewkesbury. On the right, King Edward IV, the victor at the Battle in 1471. On the left, Edward Prince of Wales, the loser at the Battle. In the lower left, the Diocese of Worcester, The Abbey was in this Diocese until 1541. Also in the border are designs of York and Lancaster roses.